Aerobic exercise such as walking, riding a stationary bike, or running is a good way to accelerate the fat burning process, as long as it is not overdone and as long as it is used only in addition to a good weight training program. It should never be used as a substitute for weight training since it does not permanently increases your metabolism and since it does not has the ability to re-shape your body. In order for aerobic exercise to be effective, it needs to be performed within the fat burning zone. The fat burning zone is the zone at which you are doing enough work to burn fat. Your pulse (how fast your heart is beating per minute) determines this zone. The result of your formula will give you an approximate value of how fast your heart should be beating per minute. For example, a 20-year-old would need to reach a pulse in the neighborhood of 150 beats per minute in order to be in the fat burning zone. It is important to remember that this is not an absolute figure, this is an approximation. 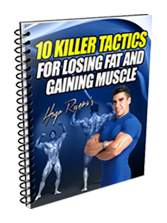 So as long as you are plus or minus 10 beats from the number that the formula provides you with, then you can rest assured that you will be burning fat. Another important point that needs to be raised is that in order for aerobic exercise to be an effective fat burner it needs to be performed at the appropriate times. There are only two times that aerobic exercise is effective in burning fat. 1. In The Morning On An Empty Stomach: The best time to perform cardiovascular exercise is first thing in the morning on an empty stomach after drinking 16 to 24 ounces of water in order to prevent dehydration. When performed at this time you burn 300% more body fat that at any other time in the day because your body does not has any glycogen (stored carbohydrates-sugar) in the system to burn. Therefore, it has to go directly into the fat stores in order to get the energy necessary to complete the activity. 2. Right After Weight Training: The other time when aerobic exercise is effective is immediately after the weight training session. The reason for this is that when exercise is not performed first thing in the morning it takes your body approximately anywhere between 20 to 30 minutes to start burning fat. This is because that it how long it takes the body to deplete its glycogen stores and switch to a fat burning environment. Therefore, it would not be efficient to perform aerobic exercise by itself at any other time during the day because you would need to perform it for 20-30 minutes just to get to the fat burning stage and for an additional 20 minutes just so that you burn fat. 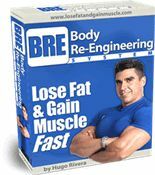 This would give a grand total of 50 minutes a day and in my opinion, I think that unless you are a competitive bodybuilder with a perfect diet and a superb supplementation program designed to protect muscle mass, aerobic exercise should not be performed for more than 6 sessions a week of 20-45 minutes a day for males and 30-45 minutes for females since this would put you at a risk of losing muscle mass. 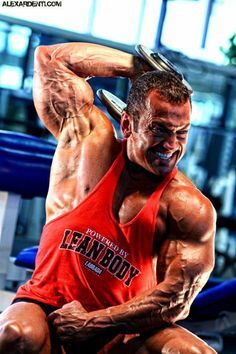 Only competitive bodybuilders sometimes need to go as high as 45 minutes, twice a day, for seven days a week. Keep in mind however that this is performed for a short period of time and only in conjunction with a pre-contest diet which consists of a high frequency of meals and with supplementation like glutamine, which helps to protect muscle tissue. Remember that more is not always better and this is especially true when it comes to aerobic exercise. Good forms of aerobic exercise are: stationary bike, jogging (this can also be done on a treadmill), fast walking (also can be done on a treadmill), stair stepper, elliptical machine, rowing machine, sets of sprinting, running, or any other form of cardiovascular activity that would raise your heartbeat to the fat burning zone. As far as frequency is concerned, I feel comfortable recommending 2 to 4 sessions of 20-40 minutes each for male bodybuilders in the off-season. If a contest is approaching, then I would gradually increase the activity to no more than two sessions per day, 7 days a week of 45 minutes each on the worst case for a short period of time. 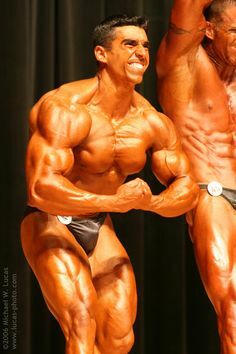 Remember, it is those long hours of cardio that cause bodybuilders to look like POWs (Prisoners of War) in the bodybuilding stage the day of the show. If you are doing 2 sessions of 45 minutes of cardio every day make sure that you take plenty of glutamine (15-30 grams per day) in addition to having at least 7 meals per day. For women, due to their higher concentrations of estrogen in the blood and due to the fact that they have less muscle mass than a male, more frequent aerobic activity is beneficial. Therefore, I recommend an off season plan of 4 to 5 sessions of 30-45 minutes and if a contest approaches, I would gradually increase the activity to no more than two sessions per day, 7 days a week of 45 minutes each on the worst case. 1. Cycle The Kind Of Aerobic Activity Being Used: Changing up the aerobic exercises prevents the body from getting so good at a specific activity that it becomes hard for you then to raise your heart rate. 2. Cycle The Duration Of The Activity: For example, a male bodybuilder that performs 3 sessions a week may do 20 minutes of aerobics on weeks 1& 2, 25 minutes on weeks 3 & 4, and finally 30 minutes on weeks 5 & 6. A female bodybuilder can use the same pattern as well (e.g. 4 sessions performed for 20 minutes on weeks 1&2, 30 minutes on weeks 3 & 4, and finally 40 minutes on weeks 5 & 6). This form of cycling will not only keep the workouts interesting but it will also prevent the body from permanently adjusting to a given length of the activity. Remember, that as soon as the body adapts, it will be tougher to reach the fat burning zone and therefore it will be harder to use aerobic exercise as weapon against fat. So there you have it. Now whenever you think about aerobic exercise, you no longer have to fear two hour sessions in a machine or losing muscle mass provided you follow the basics of aerobic exercise. Which Aerobic Exercise Is Better for Fat Loss: Walking On The Treadmill or On The Pavement? I enjoy your website very much. This might have been brought to your attention, but the way you have written your formula for calculating beats per minute is mathematically incorrect. Since multiplication and division are first order actions and addition and subtraction are second order, you would divide or multiply first before adding or subtracting. Thus with your formula if you are 20 years old, you would have to multiply 20 times .75, then subtract that from 220, which gives you 205. A much higher number than the desired 150. I understand that you have given an explanation below, but most people, when seeing a formula, do not bother to read explanations. Such a great and informative post. Cardio workout is an excellent way to burn fat, lose weight, and have better health and fitness. The key to cardio exercise is the right intensity for optimum benefits. Start small, build at a low pace and find that right intensity level, and you will get maximum benefits. Hope you doing well,I am 28 & my weight is 65 Kg but i just want to reduce the fat of my body specially in my abdominal area but i am a great lover of food which food i specially have to avoid for which i can have a perfect abdomen . Hi Hugo, thanks for the post. I just need some clarification regarding HR calculation. I always thought that a persons maximum HR was 220 minus their age. So for example I am 34 so 220-34= 186. So my maximum heart rate would be 186. Therefore if I wanted to work at 75% of my maximum heart rate I would multiply 186x.75=139.5 So to work at 75% of my heart rate for fat burning I would aim for 140 bpm. Is this calculation correct? Hey Hugo. A very informative post once again. You really have a knack of explaining things in a manner, that amateurs like me can undestand easily. 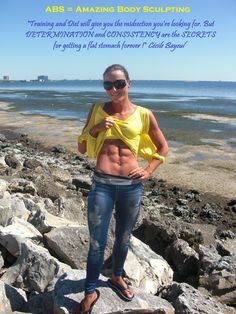 I just wanted to clarify….I have heard that doing cardio on empty stomach can cause muscle loss. So its best to have a protein shake (protein + carbs) before such morning cardio. How true is this? Cardio exercise, or aerobic exercise, is one of the most beneficial things you can do for your body. It is known to strengthen the heart muscles, improve respiration, provide muscle tone, reduce the risk of heart disease, and increase bodily energy and endurance. So it’s not surprising that a lot of people are into cardio exercise. What is surprising is how even fitness buffs still believe in certain myths about cardiovascular exercise. In this article, I will examine some common myths about cardio exercise.